The word stampatello in Italian translates as block letters, but is better interpreted as writing that looks like it was typed. There are two types: stampatello minuscolo (lowercase block letters) and stampatello maiuscolo (uppercase block letters). 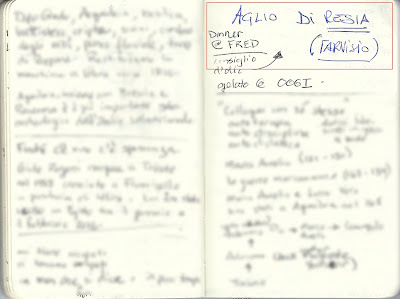 Stampatello's showy brother is corsivo or cursive lettering. Here are six examples from the last few months. 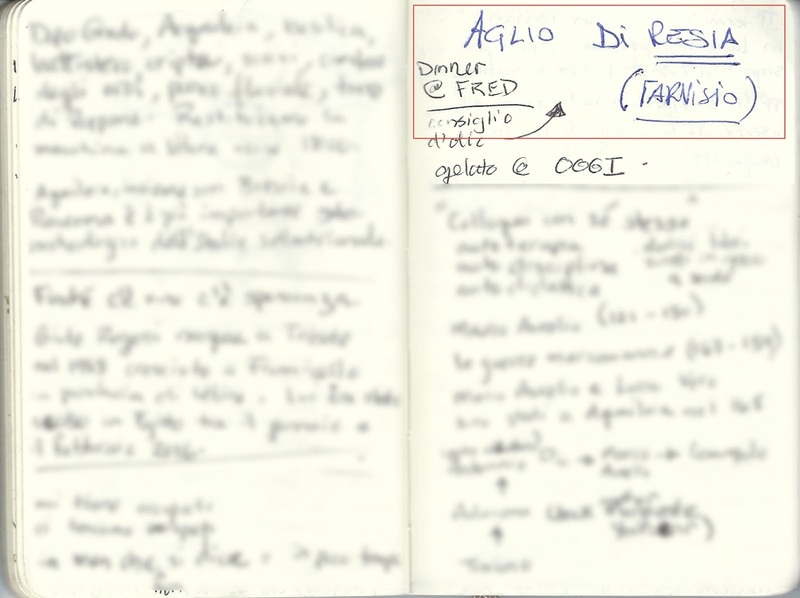 Context: We ate at an enoteca called Fred in Udine, and one of the staff wrote the name of a particular garlic we tasted called Aglio di Resia from Tarvisio. 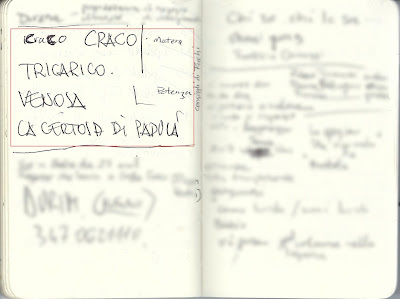 Context: One morning, in our local café, Bar Papavero, I was talking with a friend whose family is from Basilicata and she was listing places to see there including: Craco, Tricarico, Venosa, and La Certosa di Padula. Context: After lunch one day at Trattoria all'Alpino (great walk from Bergamo, see here), we were talking to the owners and told them that we would be going to Friuli-Venezia Giulia in a few days. They wrote down a few suggestions that might be of interest to us. They were: Maniago – a city known for its production of steel blades, Vajont – location of the disaster that killed over 1,900 people in 1963, and the Sequals, the home town of the Italian boxer Primo Carnera. 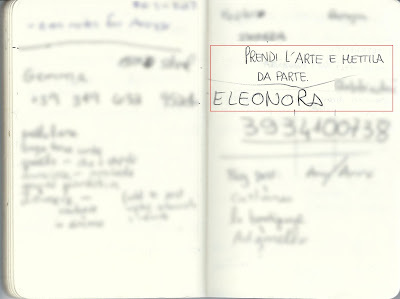 Context: In Bar Papavero, I first asked Eleonora for her telephone number, which she wrote down. 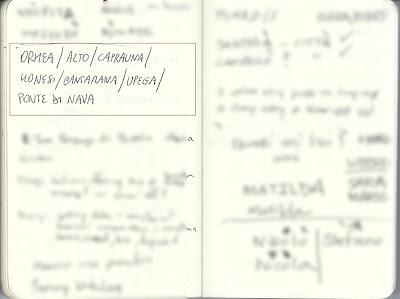 Next, I asked the granddaughter of one of the café regulars to write down a saying we were talking about. That saying is: prendi l'arte e mettila da parte – basically meaning, learn what you can, because you'll never know when you'll need it. Context: Talking with one of our "cousins" we got a suggestion on something to visit while staying in Piedmont. 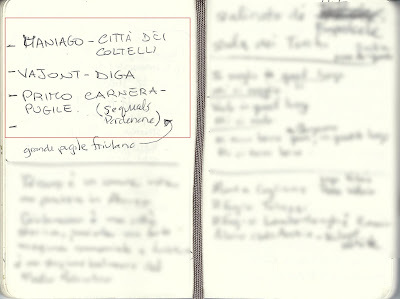 He wrote: Ormea / Alto / Caprauna / [undecipherable] / Cantarana / Upega / Ponte di Nava – all towns in the Cuneo Province of Piedmont, close to the French border. 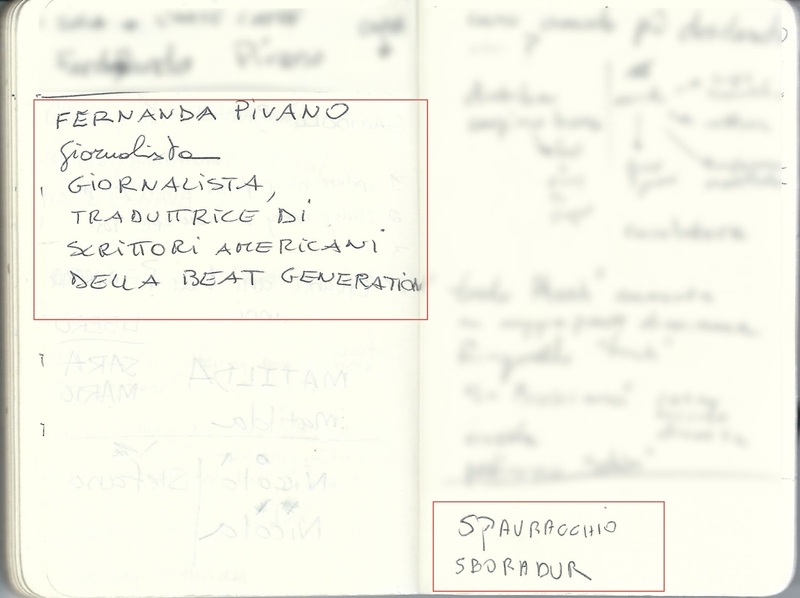 Context: One sample is during a discussion at Café Bar Papavero when I was talking with a woman about the Italian writer, translator, and journalist Fernanda Pivano. 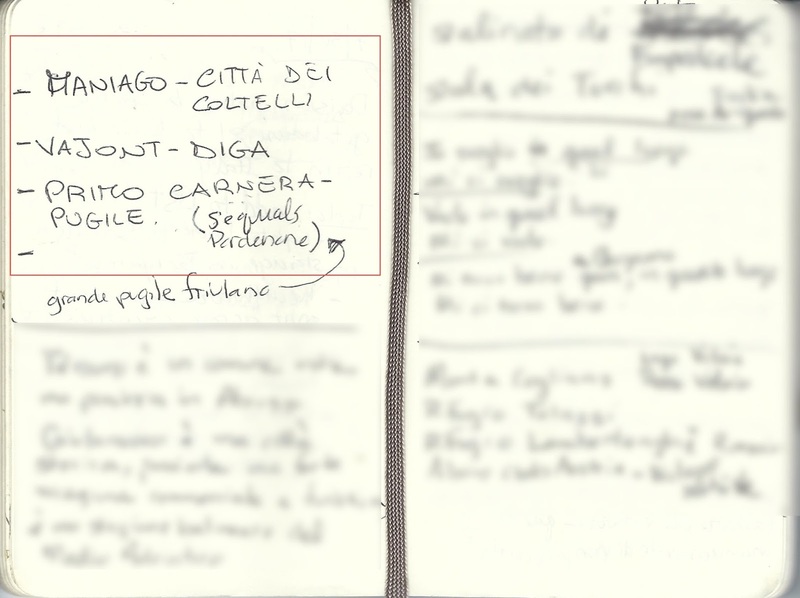 The second sample is from a woman who was on a guided tour of Bergamo's iconic Roccolo di Castagneta (Tavernella). 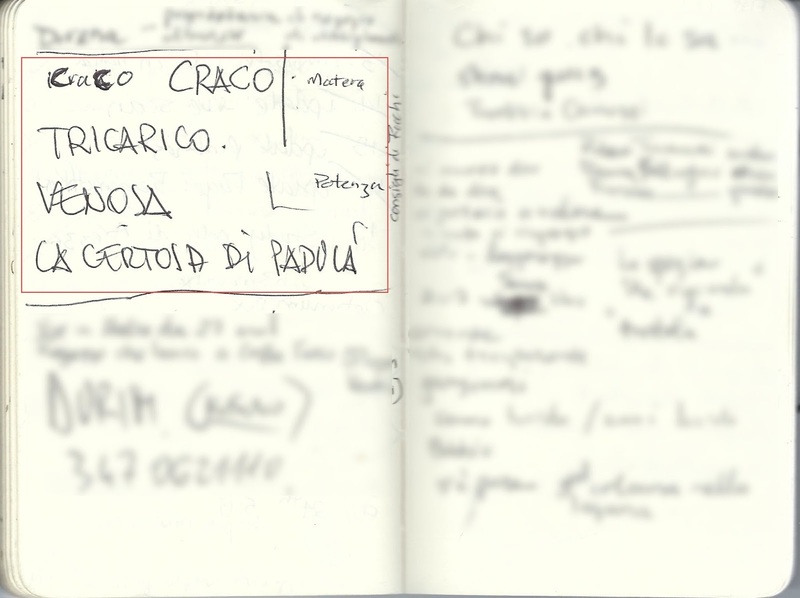 A roccolo is basically a big bird trap. For more information on roccoli, see A Walk from Albino to Bergamo via Monte Misma. During the visit of the Roccolo di Castagneta, the guide described wooden instruments that were thrown to simulate a bird of prey so that smaller birds would be frightened and hopefully fly into a waiting net. The device is called a spauracchio in Italian. 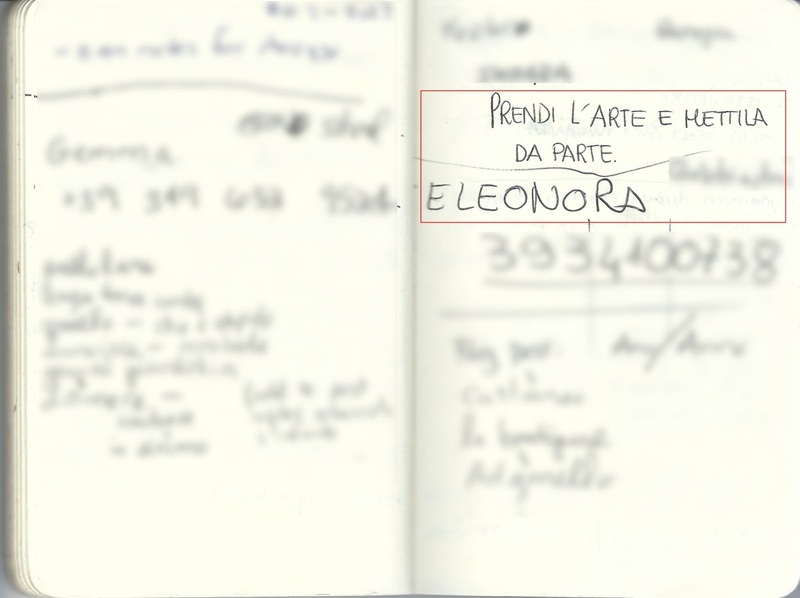 The woman I asked thoughtfully wrote it in Bergamasco dialect as well – sboradur – always in capital letters. Besides these samples, we have watch countless times as someone filled out a form (for themselves or for us) and used stampatello maiuscolo. Now, instinctively, when asked to write something official, we write in uppercase block letters, even if we can't get it out of our minds that the only people we know who used all caps are crazy family members sending the latest conspiracy email. 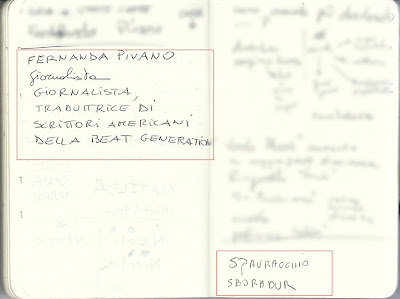 This Italian expert in the study of handwriting and criminology discusses some ideas about why Italians use stampatello. The author suggests wide-ranging reasons including hiding one's tender side (cursive being more vulnerable? ), avoiding being judged by other (bad writing? ), looking for independence and asserting oneself (by adopting what everyone else does? ), or just wanting to be legible (and sort of a conformist?). These may be all valid reasons, I don't know, but I thought one obvious reason – at least to me – the author overlooked is that Italy, a country with many dialects and languages, still struggles to achieve unification in the sense that other European countries have at least in terms of language. Maybe, stampatello is one small way of being unified.